Born on October 1, 1924, in Plains, Georgia, Jimmy Carter was the 39th president of the United States (1977-81). In 1962, he was elected Governor of Georgia. He attracted attention by emphasizing ecology, efficiency in government, and the removal of racial barriers. 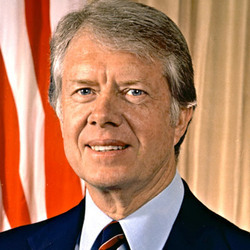 Carter announced his candidacy for President in December 1974 and began a two-year campaign that gradually gained momentum. Carter campaigned hard against President Gerald R. Ford, debating with him three times. In 1977, he become the 39th president of the United States with 297 electoral votes for him, to 241 for Ford. In 1978, he helped bring amity between Egypt and Israel. He succeeded in obtaining ratification of the Panama Canal treaties. In November 1979, radical Iranian students seized the United States Embassy in Tehran, taking 66 Americans hostage. The negociations were very difficult. The hostages were held for 444 days before finally being released on the day Carter left office. The next president is the former actor, Ronald Reagan.